According to the preliminary flash estimate of GDP for 3Q17, the Czech economy grew by 5.0% year-on-year and 0.5% quarter on quarter (vs 2Q17: 2.5% QoQ, 4.7% YoY). The preliminary estimate does not reveal any details of the GDP structure, but the Czech Statistical Office (CZSO) stated that YoY GDP growth was driven “equally by all main expenditure components of the GDP. Domestic demand grew owing to steadily increasing consumption of households and continuing growth of investment expenditure. Most of the economic activities of the national economy were successful, especially industry, but also economic activities of services." For more information and clarity, we must wait until the beginning of December, when the CZSO releases the detailed GDP structure. As such, economic growth seems to be broad-based, driven both by solid consumption of households and renewed investment activity. 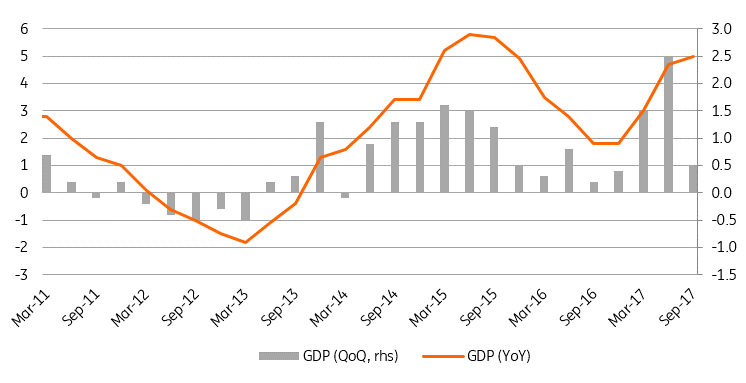 Especially investments were the main source of uncertainty for GDP growth in the third quarter, as it accelerated strongly by 6.3% QoQ in the previous quarter and caused much stronger than expected GDP growth. This was apparent also in the latest analysts’ estimates of 3Q GDP figure, as it ranged between 3.7% to 5.9 % YoY – which is unusual spread for the GDP prints. Today's preliminary GDP estimate confirms that Czech economic growth is on a solid footing and should remain favourable in the forthcoming period, reaching 4.5% for the whole 2017. This will be supported by strong consumption of households driven by accelerating wages, but also by renewed investment activity. Also, foreign demand will be supportive, especially due to positive developments in Germany, where the economy accelerated by 0.8% QoQ and 2.8% YoY WDA in 3Q, which represents the highest year-on-year growth over the last six years. As today's GDP print was in line with the latest Czech National Bank forecast, it's not a game changer for CNB's monetary decision. The positive economic story continues, so we believe that monetary tightening via interest rates will continue. Given the general caution of central banks in monetary tightening, however, we still see a higher change that next hike will be delivered during the February meeting, not already in December, as sometimes is being discussed.